Is your carpet looking worse for wear? Victim to dirty shoe marks and embedded pet hair, to spilt drinks and trodden in food, it’s about time you gave your carpet some TLC with our carpet cleaning in Bolton. Over time, your carpet can become discoloured, while the fibres can become sticky and laced with germs, but with our carpet cleaning technology, you can reinvigorate your carpet and bring it back to life. So contact us today on 01706 411590 for a free quotation. What can our Bolton carpet cleaning service do for you? At Keep Clean, we are dedicated bringing life back to the carpets of Bolton. Whether the carpet covers an office floor, a lounge floor or a nursing home floor, there’s nothing our carpet cleaning Bolton service can’t tackle. By removing the stains and substances buried between your carpet fibres, our carpet cleaning in Bolton technology can bring the colour back to your carpet. With its special formula, it also successfully removes bad odours and bacteria, which means by the time we’re finished, your carpet will be smelling as fresh as a daisy too. Our carpet cleaning Bolton team have cleaned hundreds of household carpets in the area. While some people may already possess a steam carpet cleaner, we know that it’s not just the technology that makes professional carpet cleaning in Bolton better than a DIY job. With our techniques and training, we can apply our technology using the best methods of application, making our carpet cleaning in Bolton a more effective process. We’ve seen some pretty horrific commercial carpets, but each time our Bolton carpet cleaning team has transformed and reinvigorated them. 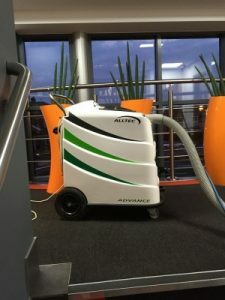 From pub carpets caked in beer stains and old food to office carpets coloured with spilt coffee and spat out chewing gum, our top of the range technology and practised technique ensures that each time we carry out our carpet cleaning Bolton, we leave a trail of cleanliness and freshness behind us. As part of our commercial carpet cleaning service, we can offer contracts to businesses looking for a company to tend to their carpet either several times a year or on an as and when basis. We can provide specialist carpet cleaning in Bolton for those who need more of a specialised service. For example, over the years, we have cleaned many carpets for the NHS, using an anti-microbial treatment that contains the necessary antibacterial chemicals for a long-lasting, hygienic finish. We also carry out a bonnet buffing service, which has proven to be extremely effective in freshening up carpets that are regularly maintained. If your carpet only requires a spruce up, this quick and quieter method of cleaning can have your carpets clean and dry within 30 minutes. Once we have carried out all the stages, we place your furniture back into its original layout and put plastic or foam tabs under the feet to ensure they don’t come into contact with your clean carpet. Why should you choose Keep Clean? We provide a professional service at a cost-effective price, which means clean carpets are cheaper than you think. As part of our carpet cleaning in Bolton service, we’ll come and assess your carpet, then offer you a quote based on the square footage that you require cleaning. We’ll also take into consideration the fabric of your carpet to make sure we use the right products and look at the condition to see how much work will be required in removing the stains. Every member of our team has been trained to supply each of our customers with a professional service. This means that not only do we pride ourselves on our outstanding carpet cleaning, but our customer service skills too. Our carpet cleaning in Bolton team can also bring your furniture, upholstery, leather and mattresses back to life. Fully approved by the Approved Carpet Cleaners Association. You can take a look at some of the before and after shots from our carpet cleaning technology in our online gallery. What are you waiting for? If you need your carpet cleaning in Bolton, contact us today for a free no-obligation quotation.